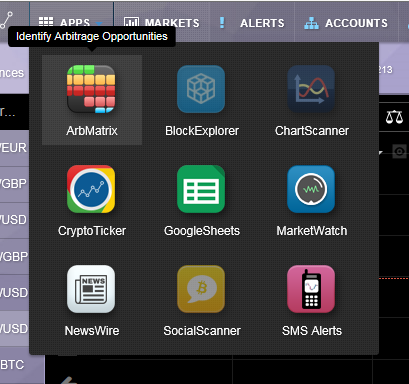 ArbMatrix allows users to spot arbitrage opportunities across exchanges. With Coinigy's wide exchange integration, users have the ability to spot hundreds of potential points of arbitration. To read this page accurately, first, choose the market you are trying to perform arbitrage on (e.g. in the above picture, it is set to BTC/USD). Next, find the exchange you currently holding funds on in the left column. Once you have found your market of choice, look across the row directly to the right to see what opportunities present themselves in the column for other exchanges. The greater the opacity green found means the greater the price difference in terms of potential profit. The greater opacity of red found means the greater potential loss should you attempt to trade from your exchange to that given exchange. Specifically, the spread is the difference between the bid on the left exchange and ask on the top exchange. The inverse spread is the difference between the ask on the left and the bid on the top; most users will find the inverse spread more useful. ArbMatrix also allows you to sort by greatest price difference or scale the grid by clicking the green or blue button, respectively, in the top left corner of the screen. NOTE: Price differentiation could be a result of an exchange's low volume. Should you decide to trade on an exchange with low volume, you may not make the return you expected. Perform arbitration with caution.